Ben Franklin is the Philadelphia godfather of American printing. He is our best celebrity printer and our best colonial kite flyer. He deserves all the acclaim he receives. Here in Lancaster County, Ben Franklin is a founding father of (Ben) Franklin and Marshall College, my favorite local college, and one of the galaxy's best liberal arts schools. Ben Franklin founded Lancaster City's first print shop, in 1751, and for six years he and his partners tried to duplicate, here, the success they had created in Philadelphia. Unfortunately, they were never able to really succeed in the Lancaster printing market. Perhaps there was too much competition with the nearby Ephrata Cloister press. Franklin's print shops sort-of fizzled out, here. But we like him anyway, and we named our Franklin and Marshall college for him. Mystische Und sehr geheyme Sprueche (Mystical and Very Secret Sayings) (1730) --- Authored by Conrad Beissel to explain his other-worldy views on Christianity, celibacy, and spiritual androgyny. Goettliche Liebes und Lobes gethoene Welche (1730) (Melodies of Love and Praise) --- This is a hymnbook of 65 hymns written by Conrad Beissel and other Cloister poets. Vorspiel de Neuen-Welt (1732) (Prelude to the New World) --- This is sort-of Beissel's New World Symphony. It's a hymnbook, with more mystical hymns by Beissel and friends. 1751: Ben establishes Lancaster City's first print shop. (Back then, the city was still just a "borough," not a city.) Meanwhile the Ephrata Cloister had already established its own print shop, beginning in the early 1740s. In 1751 Ben partnered with Quaker printer James Chattin to start printing in Lancaster City. Ben probably provided James with a printing press and type, and sent James here from Philadelphia. Ben typically paid one third of the expenses in exchange for one third of the profit, as he did with other printers in New York, New Haven, Annapolis, Charleston, and Antigua. 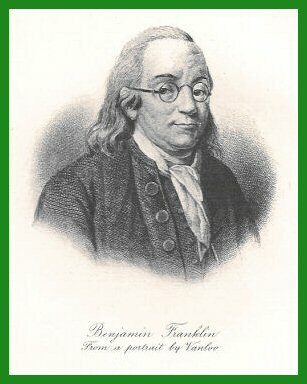 1752: Ben Franklin's partners print the first "book" printed in Lancaster Borough. The book is German-language. Meanwhile, the Ephrata Cloister had already printed the first books printed in Lancaster County. These books also are German-language. Ben sends German printer Heinrich Miller and the printer Samuel Holland to Lancaster to replace James Chattin, who returns to Philadlephia. The Lancaster print shop continues to be unprofitable. Also this same year, 1752, Miller and Holland print Lancaster's first significant newspaper, Die Lancasterische Zeitung (The Lancater Gazette.) Each issue includes both German and English text. 1754: Unfortunately, the print shop continues to fail. Samuel can not pay the bond he had given for the purchase money. So Ben Franklin jumps back in, and puts William Dunlap in charge of the shop. 1754 to 1757: William Dunlap rents the Lancaster print shop from Ben Franklin for 200 pounds per year. During this time, Williams nephew, John Dunlap, arrives in Lancaster from Ireland to apprentice in this print shop. John eventually becomes one of the great printers of Philadelphia and Lancaster, and is the first to print the Declaration of Independence. 1757: Ben's Lancaster printing business closes its doors, when Ben moves to England and sends William Dunlap to Philadelphia to replace him as postmaster. So.......although Ben Franklin's printing ventures never quite succeeded in Lancaster, his pioneering efforts here have become an important legacy to our community. ...........1. In 1763 a vigilante group from near Harrisburg, the Paxton Boys, massacred peaceful Conestoga Indians in Lancaster. When the Paxton Boys threatened to attack Philadelphia, Ben Franklin negotiated a peace. Ben then authored the book Narrative of the Late Massacre in Lancaster County, about this unfortunate incident. That book is Here at the Access Pennsylvania Digital Repository, along with many other Franklin imprints. ..........2. Ben was a musician, as well as a printer, scientist, and statesman. His personal copy of an Ephrata Cloister manuscript music book is Here. ..........3. One of Ben's most famous, but most rare, publications is his 1755 "Wagon Broadside" printed by his business partner William Dunlap in Lancaster. Ben used this broadside to request Lancaster farmers to allow General Braddock to use their horses and Conestoga wagons during the French and Indian War. Information is Here. ..........4. Ben donated 200 English pounds in 1787 to help found the Lancaster school that would forever bear his name: today's Franklin and Marshall College. That school is Here.